This is a story that I documented years ago, because it was frustrating and funny at the same time. Someday, David will be famous for his ability to turn a situation around for his benefit. After reading this, you will probably understand why! In 2009 David had some homework to complete on a Thursday, because it was due on Friday morning. He was not yet 8-years old. At the time my work schedule allowed me to pick him up at home and take him out to look for trains – along with doing his homework. Generally this method worked well; we both love trains and it was a way to keep him engaged. I tried to help him work at his own pace, while setting the goal that the work needed to be completed. The key with him is to maintain his flow rather than forcing my own. But on one particular Thursday, his flow became so funny that I started taking notes. It started when we got trackside in Seattle, at 2nd Ave S. and S. Horton Street at around 5:30pm. BK is a mere block away from where we were shooting video. So we watched trains for awhile, went and got our food (Angry Whopper meal / Kid’s Plain Cheeseburger Meal) and went back to Horton. After eating our food and watching a few more trains, it was time. So we headed that direction, just in time to have a massive freight train go through the crossing. We parked along the side of the road and I shut off the truck. He was right. I had parked on South Lander Street by mistake. So we headed north to Holgate and parked. There isn’t a public restroom for miles in SODO. No parks. So we headed south to Georgetown. He was referring to the piece of wood he uses as a tabletop while sitting in the truck. We were almost there, so we parked the truck near the Georgetown Playfield. on a side street. I dug out the board from behind the seat. David looked down there and saw something else. He tried to dig a bunch of stuff out. He managed to dig something out anyway. He pointed a Potato Gun at my head. He had managed to lose his pencil between Holgate and Georgetown. I pulled another pencil from the visor. I documented some more of our conversation on the back of an envelope. Then I went silent and looked out the window for the next 15 minutes, while David completed the three final pages. Total time involved to finish that last 15 minutes worth of homework? On the morning of the Challenger space shuttle flight, I was starting my work day at THE Graphics Company on Hinds Street in Seattle’s SODO district. 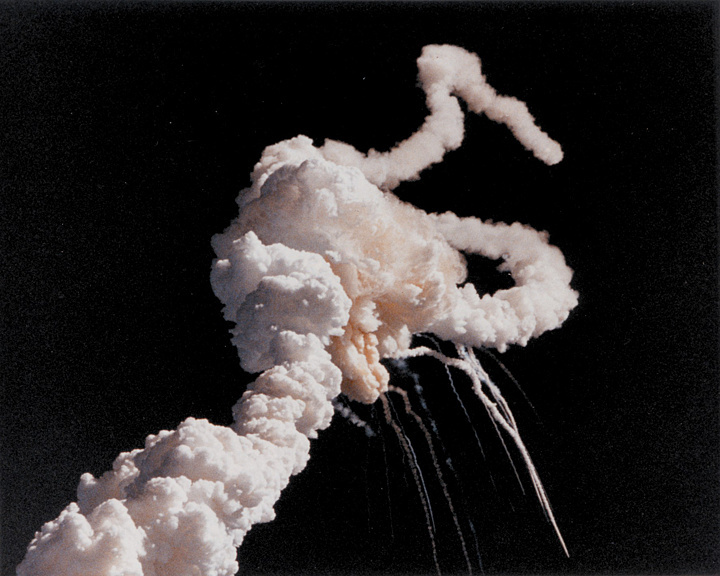 By that point the Challenger had been grounded for weeks; the shuttle flight had been delayed so many times that I lost count. If it wasn’t the weather, it was a possible mechanical threat to the shuttle that kept it on the ground. Like many, I was ready to hear that it had finally taken off and headed into orbit. “Yeah, but it’ll probably blow up now,” said the surly silk screener. The other worker and I just rolled our eyes and left. We were accustomed to his “half-empty” view on life, so we moved on and started working on the day’s signage. Almost two minutes later the surly silk screener came barreling down the stairs. My first thought – briefly – was that he was full of it. We headed upstairs to see what happened on the TV. Not long after that we couldn’t believe what we were seeing. There, in full color on KING 5, was white smoke in the sky. Lots of it. There was confusion among the announcers as they described what we were already seeing, while they refrained from telling the world what we already knew. We had just lost an entire shuttle crew to an explosion, and even if the surly silk screener was only kidding, he had predicted their end. It was sick that he was right. And a day I will never ever forget.